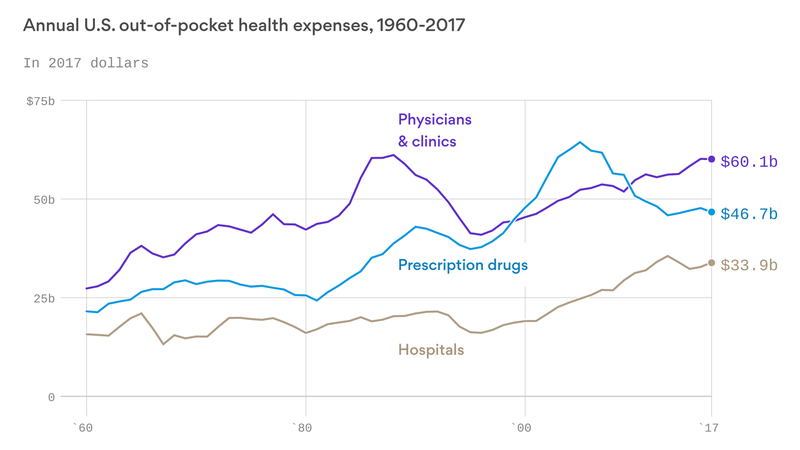 We spend more on hospital care than any other type of health care service, but hospitals make up the smallest amount of out-of-pocket spending. That means insurers are passing on a smaller percentage of hospital costs to enrollees, although they indirectly pay for hospital care through premiums. “A big role of patient cost-sharing is to discourage use of inappropriate or unnecessary services. So much of hospital care is non-discretionary from the perspective of patients,” Kaiser Family Foundation’s Larry Levitt says. Levitt adds that insurance tends to pay a bigger part of hospital bills versus other services because hospital bills tend to be large, causing patients to blow through their deductible or hit their out-of-pocket maximum.